Baer's Sign Service LLC was founded in March of 1948 by Galen E. "Joe" Baer. Self taught in many aspects of the business, Joe started the company in a small one-room shop above a garage. Now, 70 years later Baer's Sign is the oldest full service sign company in the area. 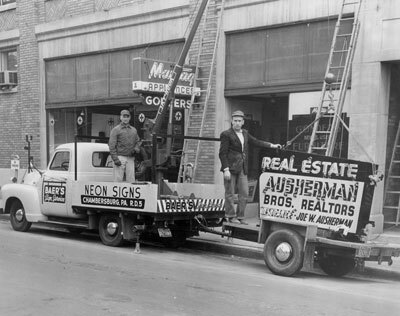 As in 1948, we still pride ourselves with quality work at a fair price. We value our customers and consider their sign needs and budget when designing a project for them. We understand that a sign is one of the most visible components of any business identity program. It provides clients and customers with an important initial impression of the product or service offered. We will gladly review all aspects of your signage needs and offer a complete sign package-from designing and construction to installation and maintenance. Contact us today about your signage needs, whether large or small. To better serve you we would greatly appreciate a call or email to accurately fill your orders.